A week of 70-degree days: at long last, the weather is shifting toward spring. After so many weeks of winter, it’s nice to feel the sun’s heat again. It’s high time to get my garden patch ready for new plants. Yesterday afternoon’s balmy weather inspired me to (finally) pull up the frost-killed basil, peppers, and assorted cold weather weeds blighting my raised beds. Since our historic date of last frost is February 12th, it’s high time to get spring plants in the ground. I think I’ll head to Banting’s Nursery (3425 River Road, Bridge City, LA) this weekend for some tomato plants and compost. Banting’s is a local retailer for “Zoo Doo Gold”, a soil enricher made from composted Audubon Zoo organic material, packaged in biodegradable bags. 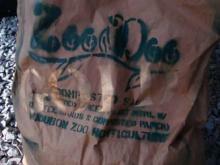 Zoo Doo is also available directly from the Audubon Zoo Marketplace, and zoo admission isn’t necessary to shop in the store. Several weeks ago, the Baker Creek Heirloom Seeds catalog arrived in my mailbox, and I’m trying to narrow my choices. (Or I’ll just have to expand my garden! ) It’s hard to resist heirloom beans like the tiny, brown Monkey Tail cowpeas, the White Wonder cucumbers, or the incredible variety of herbs. Based on last year’s garden performance, I’m planning to expand my pea patch, give up on the artichokes (the plants take up too much room in my limited area), figure out a better support system for my cucumbers, and try to find a little space for canteloupes or muskmelons. Meanwhile, I finally picked the very last citrus fruits. It’s time to prune any especially tall citrus branches (only because I don’t want to use a ladder to pick fruit), fertilize, and clear grass from beneath the trees. Tomato plants are in the ground. I went a little crazy with the Baker’s tomato varieties — here is what I have (3 plants each): Emerald Evergreen, Yellow brandywine, Brandywine, Black Icicle, Chadwich Ckerry, Goldman’s Italian-American, Principe Borghese, Gajo de Melon, White Queen and Lollipop. Plus a few Romas. We’ll see what we get. I also have several varieties of squash, a couple kinds of beans and eggplants, and several okras, but haven’t planted the seeds yet. My desert planting guide says March is a good time to get those in the ground, and based on my experience last year, even later for the okra. Wow–that’s an impressive list of tomatoes. Did you plant seeds or buy transplants? I’ve had NO luck with the Brandywine variants–they don’t seem to like our warm nights. Never got more than 1 or 2 fruits per plant, early in the season. Black icicle looks really cool, doesn’t it? All from seeds. They probably should be separated more than they are (a little less than 2 feet), so I may end up with some new hybrids. Somebody told me a few years ago that one of the secrets of growing tomatoes in the desert climate is to not stake them too much and let them grow together and shade themselves. It worked last year, although I had to crawl into the tomato forest to harvest some of my crop. Looks like it would work with our setup. When the plants get taller I’ll try it. By the way, I did start these from seeds, but they spent the first six weeks in the house, and I transplanted them last week.